When you close your eyes at night to dream does your mind take you to a place where you can hear the crackle and feel the warmth of the fire amid comforting images of roasting marshmallows and relaxing with family and friends? Then chances are you are dreaming of your own outdoor fireplace or fire pit. Homeowners are taking their backyards to a new level by adding an outdoor fireplace or fire pit. Owning one of these glorious feast for the eyes and the senses has become the crown jewel of outdoor structures. Being able to entertain, or just “hang out” with the element of fire close at hand takes being outdoors to a place where all your senses come into play, and the result is as unforgettable as some of the outdoor fireplace and fire pit designs that come to us in our dreams. Deciding to add an outdoor fireplace or fire pit to your backyard, or in addition to your existing outdoor structure can be a big step for many homeowners. Archadeck of Austin has been in the business of creating award-winning outdoor fireplaces and fire pits for our customers here in Austin, TX for many years now, and we know a thing or two about the correct way to ignite quality and style into the construction of your outdoor fireplace or fire pit. Here are some of the important considerations to think about when deciding to add one of these stunning structures to your life. There is more than one method to obtaining fire in your outdoor fireplace or fire pit. There is of course, the traditional wood-burning structure that we are all familiar with. When considering a wood burning structure the dimensions of the fireplace itself are important. The smallest capable wood burning fireplace can be built no smaller than 5×8 and has to be at least 2-3 feet deep in order to function properly. Outdoor fire structures can also be lit by gas through a gas started system or full burning gas log kits. In either case the “draw” needs to be correct on a fireplace or fire pit, and this can only be achieved by having a professional outdoor fireplace contractor build the structure for you. Improper drawing on a structure such as this can be dangerous and cause a safety hazard, so the chimney itself has to be designed and constructed properly to achieve an appropriate draw. 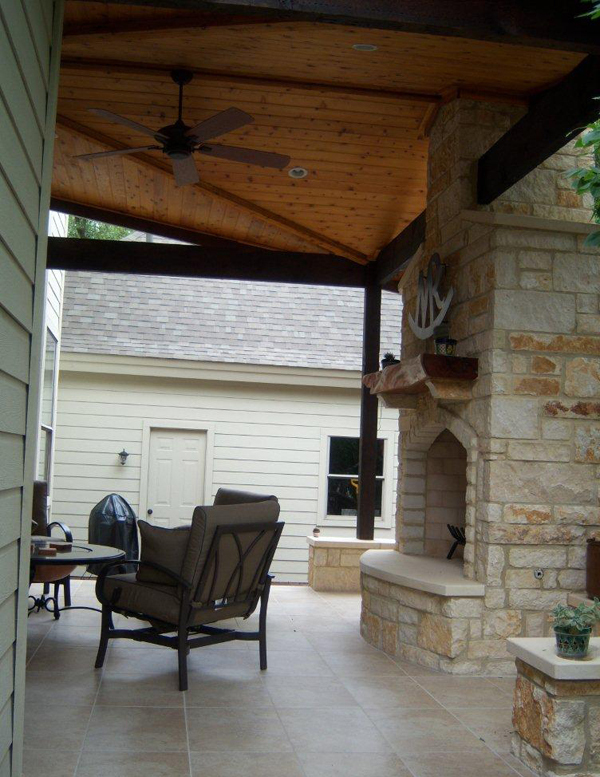 This patio and custom fireplace by Archadeck of Austin make the perfect pairing of style and beauty. When considering the design mediums that outdoor fireplaces and fire pits can be built with, typically the wood burning structures are either masonry or stone. 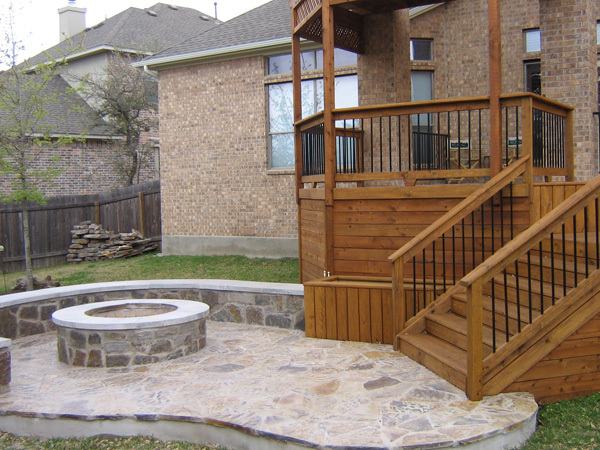 Archadeck of Austin uses a great deal of flagstone for our outdoor fireplace and fire pit designs, it looks the part and is a high quality stone that functions well with the fireplace itself. The main aspect when looking at material choices is that they are acceptable for use on a fire structure and that they hold up well under the conditions. Flagstone is strong, beautiful, and can take the heat well and will look gorgeous for many years to come. Another design consideration is whether to embellish or add anything to the structure. Some homeowners add mantles which can serve as a focal point for your structure. We place the mantle 12″-18″ above so it is not flush with the grade therefore the heat can radiate at a similar level. Mantles provide more aesthetic appeal in form than in function and aren’t really used much. However, fireboxes are a useful addition to your structure. You don’t want the firebox area to be too large, but large enough to hold wood or other essentials. If you are thinking of integrating the firebox into the structure itself, it will have to comply to building codes and be built within certain dimensions. This stunning stone fire pit by Archadeck of Austin doubles as a planter and water feature as well. As any seasoned outdoor fireplace designer can tell you, outdoor fireplaces and fire pits are the perfect companion to other outdoor structures. They look great built with and alongside covered or uncovered patios, covered porches, pergolas, and even screened porches. It is not just about beauty though, functionality plays a key role in the attraction. Being able to enjoy an outdoor fireplace or fire pit in conjunction with your outdoor structure adds ambiance and fun beyond comparison. There are certain codes and rules associated with building a fireplace in and around another structure that require the chimney and flue stack be a certain elevation higher and a certain distance from surrounding walls, especially where a wood structure is concerned for the risk of heat build-up. In these cases wood will have to be a certain distance away from the structures internal flue. Each state and county has certain criteria to follow for safety reasons and your outdoor fireplace contractor will see that these guideline are met accordingly. Contact Archadeck of Austin to learn more about our custom outdoor fireplace and fire pit designs and set your course ablaze with a structure to enjoy for years to come. This entry was posted on October 4, 2011 by austinporchandpatio. It was filed under Austin fire pits, Covered patio Austin, Covered Patios, Decks, Flagstone, Freestanding covered patios, Outdoor fire place, Patios and was tagged with Archadeck of Austin, Austin covered patio, Austin covered patio deck, Austin decks, Austin flagstone outdoor fireplaces, Austin outdoor fire place, austin outdoor fireplace, flagstone outdoor fireplace, Flagstone outdoor fireplaces Austin TX, outdoor fire pit, Outdoor fire pit contractor Austin TX, Outdoor Fire pit designer Austin TX, Outdoor Fire pit expert Austin TX, outdoor fireplace, Outdoor fireplace contractor Austin TX, Outdoor Fireplace Designer Austin TX, Outdoor fireplace mason Austin TX.